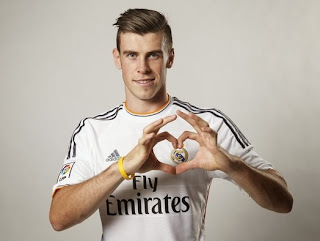 Gareth Frank Bale (born 16 July 1989) is a Welsh footballer who plays for Spanish La Liga club Real Madrid and the Wales national team as a winger. Bale began his professional career at Southampton, playing at left back and earning acclaim as a free kick specialist. He moved to Tottenham Hotspur in 2007, for an eventual £7 million fee. During his time at Spurs, managerial and tactical shifts saw him transform into a more offensively-oriented player. From the 2009-10 season, Bale became an integral part of the team, rising to international attention during the 2010-11 UEFA Champions League. He was named PFA Players' Player of the Year in 2011 and 2013, and was named in the UEFA Team of the Year in 2011. Bale has received plaudits from his peers, who have described him as a footballer with "tremendous speed, great crossing ability, a great left foot and exceptional physical qualities". During the 2012-13 season he was awarded the PFA Young Player of the Year, the PFA Players' Player of the Year and the FWA Footballer of the Year awards. On 1 September 2013, he was transferred to Spanish team Real Madrid for an undisclosed fee. The Spanish press (and Real Madrid TV) reported £77 million (€91 million), while the English press reported a world record transfer fee of £85.3 million (€100 million), which would be above Cristiano Ronaldo's transfer record fee of £80 million (€94 million). Bale scored on his Real Madrid début, a goal coming in the 38th minute against Villarreal CF, before being substituted later in the game for Ángel di María. Bale's second appearance for Madrid came in a 6-1 victory over Galatasaray in the Champions League. Although Bale only played the final twenty-six minutes, his free-kick led to Cristiano Ronaldo's second goal of the game.